Mention Netgear and chances are pretty good that networking devices come into your mind, be they routers to switches and hubs. Well, the company just announced two more next-generation HomePlug AV-certified powerline kits in the form of the compact Powerline AV 500 Adapter Kit (XAVB5001) and the Powerline AV+ 500 Adapter Kit (XAVB5501) with a filtered “pass-through” power socket. Theoretically, both of these devices are speed demons, capable of hitting speeds of up to 500Mbps, but we know that in real life things are a whole lot more different, what with interference and other niggling problems that bring the figure down to a more realistic level. Apart from that, both Powerline kits are able to offer whole-home coverage and groundbreaking throughput that have no rival to this day. Expect to find the latest in technological innovations within both devices, where they were specially designed to play nice with the draft international IEEE P1901 Powerline standard. Apart from that, they are able to offer greater speeds for bandwidth-hungry applications including lag-free Internet gaming, Voice over IP (VoIP), large file transfers to networked devices, and for home theater enthusiasts, even simultaneous 1080p HD video streaming to multiple TVs throughout the entire home. You will be able to spot the Netgear Powerline AV 500 Adapter Kit (XAVB5001) easily thanks to its relatively compact form factor which is smaller than your regular deck of cards, and up to 50% more compact compared to its market rivals. Perfect for those who are looking for a Powerline device that won’t block an open power outlet when plugged in. 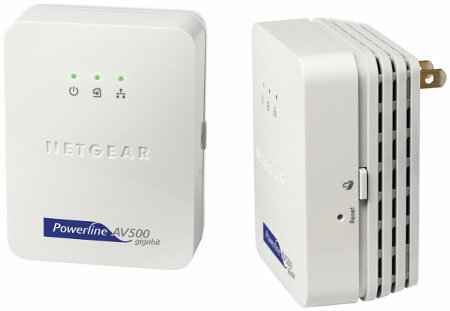 As for the HomePlug-certified Powerline AV+ 500 Adapter Kit (XAVB5501), it has the similar performance and design benefits as the Powerline 500 AV Adapter Kit, but you get a cutting-edge integrated filtered power socket for “pass-through” capability as well to ensure an existing wall power socket with the adapter is not cannibalized. No idea on pricing, but they will be out later this Q3, so stay tuned!